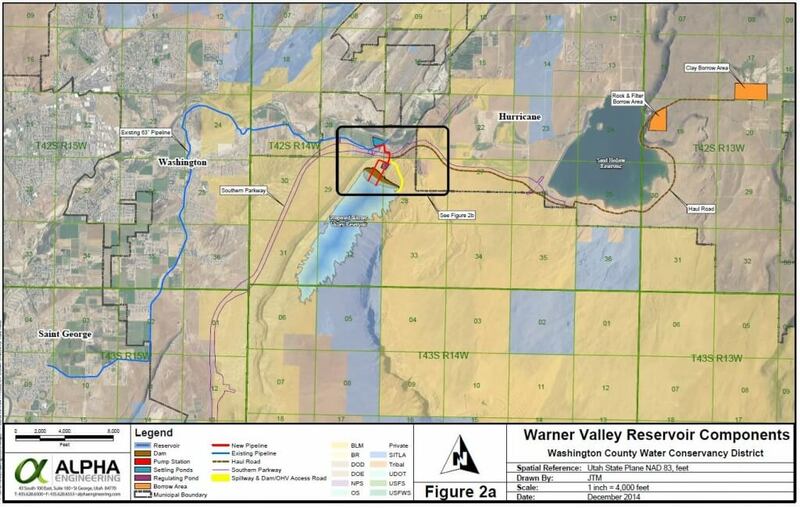 The district’s proposed Warner Valley Reservoir would be the largest reservoir built to date in Washington County, currently planned to store up to 55,000 acre feet at full capacity on approximately 800 acres. The approximately $99 million project will feature a 3,300-foot long and 235-foot high dam, spillway, approximately 7,000 feet of pipeline, a five-acre regulating pond, settling ponds, pumping station and access/haul roads. The settling ponds will divert and remove sediment directly adjacent to the Virgin River and the pump station will move water into the reservoir. Water will be transported to municipal irrigation systems via underground pipelines. The regulating pond will provide consistent flow and pressure. Construction would commence after necessary permits are obtained and all plans are finalized, which is expected to occur in the 2020s. The reservoir and pipeline would be constructed simultaneously with an anticipated 15-month building timeframe.